It’s not often that you see a support act receiving a standing ovation, let alone see a support act who, in their own right, is considered worthy of having received an Ivor Novello award for outstanding song collection and has played with such luminaries at Eric Clapton, The Spencer Davis Group and Traffic. 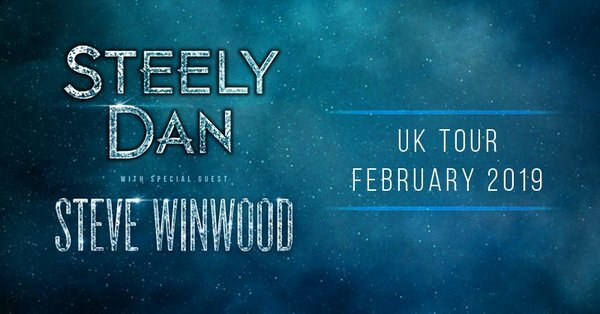 But that’s what we saw and heard at the SEC Hydro in Glasgow as Steve Winwood supported Steely Dan. Taking to the stage with little in the way of fanfare, Winwood and his 4 fellow musicians, all casually dressed and avoiding any hint of the trappings of the ‘star’ lifestyle, waste no time in getting to the point of their set – to play the hits for us. Opening his set with The Spencer Davis Group’s ‘I’m a Man’ Winwood, sat behind his Hammond organ, seemed happy and excited to be in Glasgow for the opening night of the tour. By the time we reach the Blind faith track ‘Can’t Find My Way Home’ Winwood has swapped the keyboard for the guitar and is front and centre proving that he is just as adept as a guitarist and singer and the crowd are loving it. The lighting for this show is superb, as are the abilities of the musicians on stage with Winwood and this is noticed and appreciated by those of us in the crowd and we are clearly aware of the amazing set that is unfolding in front of us. Winwood takes a moment to address us as a crowd, commenting that, whilst the set running order might not be chronologically correct, it is his history. The hits keep coming as the set progresses and the crowd are on their feet for ‘Keep On Running’ which is followed by a slow keyboard build up to an absolutely blinding version of ‘Higher Love’. Throughout the set we are treated to beautiful music, great guitar, sax and keyboard interludes and solos and, as the set heads towards its close, we go full circle back to the Spencer Davis Group with ‘Gimmie Some Lovin’ to finish. The very second the set finishes we are on our feet for a long, and very well deserved, standing ovation. Winwood and his band leave the stage with what appears to be genuine astonishment at the reception received from the Glasgow crowd and we are aware we have just witnessed a masterclass of solid musical entertainment and musicianship.